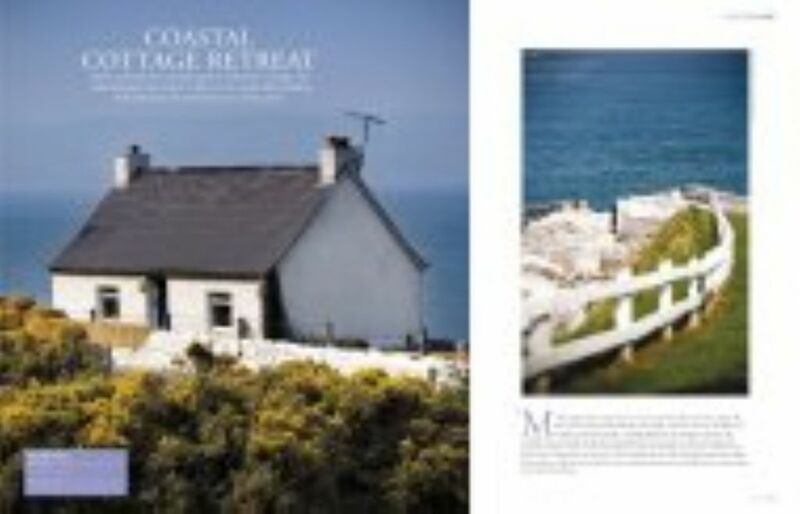 Cottage in Waterfoot, County Antrim, Ireland - Voted Regional Cottage of the Year. Situated on the water's edge with spectacular views from all aspects. Fallowvee has been sensitively restored and upgraded to include all home comforts. Voted regional cottage of the Year and NITB host of the year. Historically part of Lady Londonderry's Estate, the old weighbridge and pier were gifted by her to Sir Winston Churchill. Spacious bathroom with limestone floor. Large cast iron bath with wood panelling overlooking the sea. Perfect for a glass of wine and a soak. Stand up glass fronted power shower at end of bath. W.C sink & hot press. Large feature mirror and linen basket. Open plan living/dining room, with original paintings, traditional open fire, large picture windows overlooking sea & slate floor. Flat screen TV with SKY/BT Sports channels, IPod dock, Internet WIFI. Dining area & antique dresser (with board games). Cushendall golf course nestles at the foot of the beautiful Glenballyeamon in the celebrated Glens of Antrim. This small, picturesque nine-hole course is bounded by the quaint village of Cushendall (Known as the capital of the Glens) on the landward side, while the waves of Red Bay pound its northern shores. The River Dall meanders through the course to the sea and it is to its presence that the course owes its” tricky” reputation. Its murmuring waters create out of bounds at the first five holes and reappears with a vengeance at the last two, making any wayward shot almost sure to find a watery grave. The cottage is also within an hours drive of the five magnificent north coast courses Ballycastle, Castlerock, Portstewart and the two courses at Royal Portrush which hosted the 2012 Irish Open. Travelling towards Belfast it is only a short journey to the 18 hole Cairndhu Golf course and again within an hour you will find yourself in Belfast with its many courses. Outside: Situated on the coast with the majestic glens of Antrim in the back drop. There is a private front garden with barbecue facilities, as well as a pier ideal for fishing. Utility Room: Washing machine and separate Tumble dryer. Ironing facilites. Dyson Vacume Bath towels, kitchen towels. Set of bed linen for duration of stay Please bring own washing products. Cleaning / Towels / Linen / Maid service: A set of both towels and bed linen are provided for guests. Additional cleaning service can be arranged through your host John at an extra cost if required. There is a washing machine, tumble dryer and Dyson vacumn for upkeep during your stay. Other: The cottage is decorated throughout with paintings of the local area by artist/owner Johanna Spencer Boyd. Excellent place to stay with excellent views. The cottage is cosy and clean. Everything you need is in the property. It is also a good base to be able to roam around the attractions of Northern Ireland. The only problem we had was the parking as you are coming from a blind spot to a busy road. Fallowvee Cottage is a wonderful place if you are looking for endless sea vistas and dramatic scenes of sheep dotting the craggy glens across the street. You will need a car to get here, preferably a very small car, and count on some time to drive anywhere. The Cottage is close to several villages and not too far from the major attractions in the north such as Carrick A Rede Rope Bridge, The Giants Causeway. Etc. The Cottage has everything one could ask for. The housekeeper Una was very friendly and helpful as were all of the folks we met in Northern Ireland. I would go back to Fallowvee in a second! Fantastic property with great history. Amazing place to come back to after a day of sight seeing. Light the coal fire and time for a single malt. Couldn’t ask for more. We very much enjoyed this cottage. Una was very easy to reach and made the check in and check out process very simple. She was wonderful to chat with and provided us with some very interesting details and history surrounding this amazing property. We were very comfortable here. We did not use the kitchen at all as we only stayed a few nights. We were out and exploring each day. The views from this property are stunning. We stayed a few other places while visiting Ireland and this was the most quintessential by far. Nearby Glenariff Forest Park has some stunning waterfalls, scenery and walks. An hour will take you to Belfast and the Titanic Quarter with its new visitor centre which will tell you all you need to know about RMS Titanic and the many other ships built in Belfast. The world famous Giants Causeway is within easy reach, travel up the beautiful Antrim Coast road to get there you won't regret it. Less than an hour by car from Belfast to a completely different world of Fallowvee heaven, good for your soul a real retreat .Or has lively as you want it! Ideal fishing location with regular fishing trips available from local providers. Booking Notes: Refundable security deposit. Changeover Day: Mostly Friday afternoon around 4.00 Departure around 12.00 Notes on prices: Prices are for the property for a weekly basis and in Sterling. Please email for prices for 2 or 3 nights.